I'd like to say THANK YOU to all of you who have shared your WINDSURFER STORY by emailing me or on FaceBook. All the stories have been unique and it's wonderful to read how people discovered windsurfing and the impact it's had on their time on this planet. I believe the Original Windsurfer website has reminded people of their "AH-HA" moments and reconnected them with what's important in windsurfing. I also think there's some "re-discovering" of the sport going on as sailors re-evaluate what they want from the sport and for themselves. 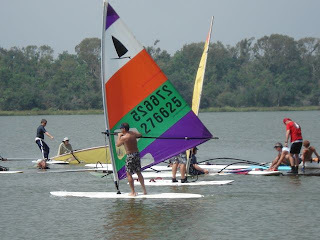 I just got back from a Windsurfer Regatta! 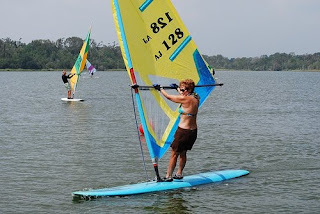 The Windsurfer One Design American National Championships (aka: the DINO races) were last weekend and I can report that the spirit of Windsurfing is alive and strong just outside Houston, Texas. You can read more about the event below. What made this a unique regatta was that the friendly folks who hosted the event asked sailors to bring their own Windsurfers, but if you didn't own one or were new to racing, they tried to provide one for you. Because there were more competitors than boards, we all rotated boards each race, this made for a very level playing field. And a strange thing happened: I surprised myself on the 3rd race because I was assigned what looked like a very, shall we say, a very "well-loved" Wally but she didn't let me down --I placed better than the previous race! And I was reminded that it isn't about the equipment, it was about ability. We met a lot of genuinely nice people and had a really fun weekend, and I got to go windsurfing! 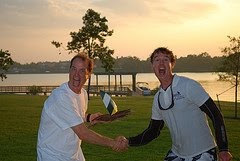 After all these years of sailing solo, I still (kinda) got it on the race course, I placed 2nd in my class (that is the over 40 with a beer gut class in case you were wondering). Upcoming events are the Australian Championships Jan 24-26 in Port Stephens (north of Sydney); Windsurfer Revival Event on the island of Sardinia in Italy May 2-8; To find our more about upcoming events visit the "Downloads" page at the Original Windsurfer website http://www.originalwindsurfer.com for Notices of Race in the "Current" section (once I receive a Notice of Race I'll post it). Or email me and I'll try and help you get the info you're looking for. 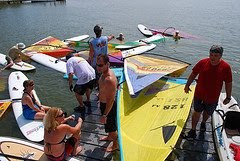 There's also been some noise generated about a Windsurfer event in the Fall of 2010 in the U.S. that may be a World Windsurfer Celebration event, maybe a kinda Windsurfing Woodstock to celebrate the sports 40th + years, more to come on that as this comes together. Again, let me know what you think. Check out the Original Windsurfer FaceBook page! Share a picture, declare your love for the sport or just have an Original Windsurfer moment. 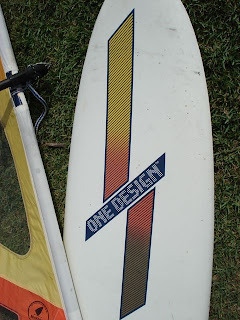 By the way, there's a few links at the bottom of the "Quotes and Stories" page on the Original Windsurfer website that has a few Windsurfing links to check out. 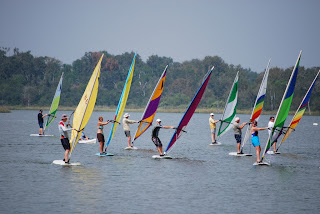 This grass roots event was organized by the fleet of Windsurfer One Design enthusiasts outside of Houston, Texas and attracted 30 sailors, it took place at Clear Lake Park. Six races were held in light to moderate winds. The 30 sailors were divided into three classes. Starts were alternated and sailors rotated boards each race so each competitor sailed a different board in each race because there were more sailors than boards. 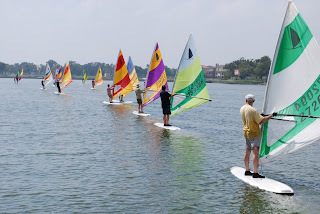 A tight start line, a subtle ebb tidal current and slight wind shifts made for tactical sailing conditions for seasoned competitors and pleasurable conditions for the beginner racers. The mood of the event was casual and fun, no protests were made. A party barge anchored off the windward mark and stocked with “refreshments” provided front row seats and shade to sailors that were waiting for their next race, and friends and family to heckle at competitors on the racecourse. 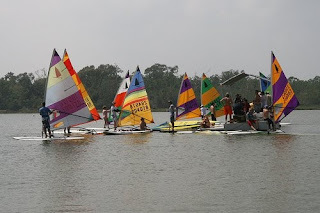 Also known as the Dinosaur (DINO) Races because the sailors have maintained their Windsurfer One Design races and their original equipment; these enthusiasts have preserved the fun and social aspect of the Windsurfer One Design Class events of the 1970s & 1980s. All the photos on this posting are from the Nationals, photos taken by: Susan Taylor, Hauk Wahl, Chuck Taylor and Brad Bickle.